The ClampTite tool provides a way to tighten wires wrapped around an object and then lock it in place. The ClampTite tool can be used with various sizes of wires, eliminating space and strength issues often encountered with screw-operated worm-gear type clamps. Whether you're looking for a quick and effective emergency leak repair or a bulletproof means for securing nearly any material from rubber hoses to spliced wires, this new and innovative tool is a must-have addition to any tool chest. Quickly replace ineffective or damaged conventional hose clamps with a temporary or permanent clamping mechanism formed from stainless steel safety wire. Clamps formed using ClampTite seal a full 360 degrees with no flat spots and can be used to band any type or size material. These kits contain everything you need to get started: the tool, plenty of wire, and a convenient carrying case to keep it all together. 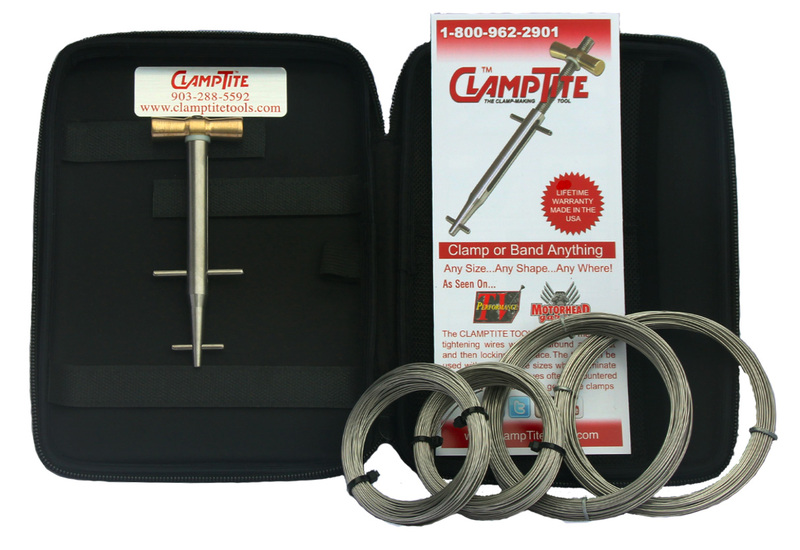 We have the Premium kit CLT01K, which includes the Premium Stainless Steel ClampTite tool and four rolls of wire. This tool is machined stainless steel with a one piece body and nose and bronze nut. The tool was designed with the detailed craftsman who needs a long lasting tool able to hold extremely tough wire while clamping, binding and pulling the wire until the job is complete. The Premium tool can handle wire sizes up to .062" including sizes .032", .041" and .051". The tool is designed to handle that size wire because the body is bullet-proof and the wire will fit into the notch. In emergencies, customers have been known to use a coat hanger.